March 28, 2006 - 6:00AM - Darra has entered our hospice care program. Her breathing has become shallow and she has a slowed heart rate. We will be with her at all hours to make sure she is comfortable. March 28, 2006 - 5:00PM - Darra spent over an hour outside this afternoon. The day was beautiful, with lots of sunshine to keep her warm. We set up a padded bed with plenty of soft towels for her to nestle in. Afterwards, she was brought back inside and tucked in for the night. She slept continuously for the next 12 hours. March 29, 2006 - 10:00AM - Darra is no longer interested in food. Her mission is clear. We will continue to monitor her as the day progresses. March 29, 2006 - 5:00PM - Darra has slept all day with little or no activity. Her breathing is even more shallow than before. It is obvious her time with us is coming to a close. She is not in any pain, nor is she in distress. She is simply readying herself for the next journey in her life, when she travels to the Rainbow Bridge, to be with all of the others that have gone before her. March 30, 2006 - 4:00AM - Darra seems to be asking to go outside, however, she is not conscience and unable to stand on her own. She was taken outside, wrapped in a warm towel, and allowed to breath the cool morning air. She stayed outside for several minutes, being held and cuddled. March 30, 2006 - 9:15AM - Darra has completed her journey to the Rainbow Bridge. In the year that Darra has been at Scottie Kingdom Rescue, she had many medical issues that were addressed and some that couldn't be resolved, yet she stayed with us, enjoying the final months of her life while being loved not only by all of our volunteers, but also by the other Scots. Darra will be privately cremated and returned to Scottie Kingdom Rescue to join her cousins that preceded her to the Bridge. Darra, You Are Now Whole Again. We rescued Darra from an out of state kill shelter, knowing she has some medical problems. She is a senior Scot, approximately 10 years of age. Darra has had severely elevated liver counts, among other issues, however, with the help of our wonderful Vets, she is doing much better. During her stay with us, Darra suffered a stroke which causes her to be unstable on her feet, and carry her head at a tilt. She is not in any pain and actually functions quite well. Darra is also hearing impaired. 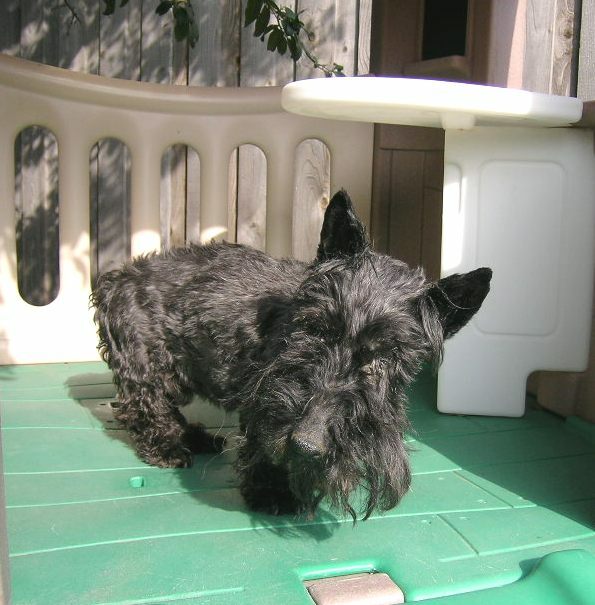 With all of Darra's medical issues, we realize she is considered unadoptable, however, there's no reason why she can't live the rest of her life with us, being well cared for, and having playtime with some of the other Scotties that are so considerate of her. They all show her an immense amount of respect. Darra's medical care and fostering expenses have been immense. If you are able to assist with the costs involved in Darra's ongoing care, she would be so appreciative. She deserves to live her remaining time knowing that she is loved. Scottie Kingdom Rescue, Inc. is an Approved 501(c)(3) Non-Profit Organization. Your Contribution is a Tax-Deductible Donation to the extent allowed by law.